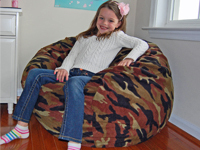 Huge Selection of Kids Bean Bag Chairs! 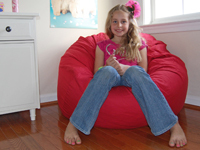 Ahh...Our bean bags hold up to your kids! Ahh! Products vs. Your Crazy Kids! from Ahh Products on Vimeo. *Recommended age is 3 years and up. We know that children are not exactly gentle when they play, in fact, they are crazy! So, we have built super strength and quality into our products. 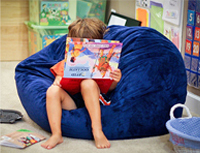 In fact, all of our bean bags are covered by a fantastic 10 year warranty so you don't have to worry about them falling apart like with other companies. The warranty includes our covers and liners! If a seam breaks, if a zipper stops working, or if anything happens that's covered, we will take care of you right away. But, don't worry, we hardly ever have any issues! Speaking of liners, unlike other companies, our liners are water-repellent and extremely durable. No more leaking filling, no more thin or cheap liners, no more headaches! How do you wash the cover? 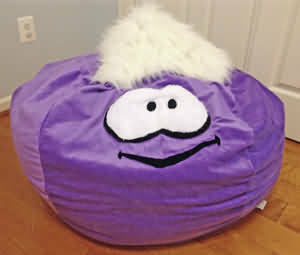 Just unzip it and throw it in your regular washing machine so you know your children are enjoying a clean bean bag year after year. To put the cover back on, don't force the big puffy liner in. That may rip the cover! Just "nudge" it in like a tight pillow case, pushing on it as if you're nudging the filling inside. 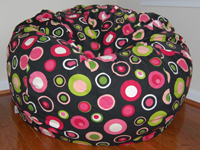 Do one section, then turn the bean bag around a little and nudge another section in. Keep doing this until you've got about half to 2/3s inside the cover, then shake the rest in. The liner will want to go inside the cover at this point thanks to gravity. Give us a call if you want us to help you while you do this. Be careful not to rip the fabric corners where the zipper ends are. 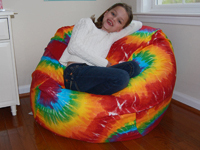 "We bought your giant bean bag for our daughter years ago who has severe ADHD and other learning disabilities including autism and we absolutely love it! It's really been a life saver for us to get her focus and help her to learn - she can wiggle around in it and doesn't have to sit still. Thanks, C.E." 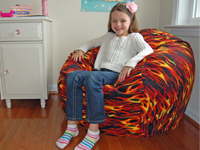 "I ordered one for my 5 year old for Christmas and we love it! I will order one for my 8 year old, too!" -S.V. 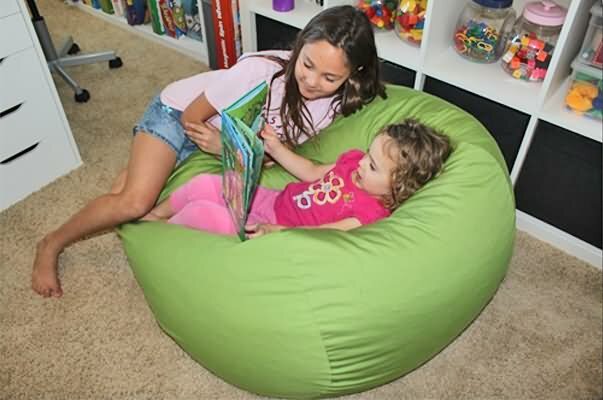 "Thank you so much, the kids love their beanbag chairs - and so does a frantic mom and dad of twins!" -D.M. "They are a GREAT BIG HIT, they are for my two grandkids. Thanks for the fine work you did." -S.S.
"I am a big fan and have 3 of them that the kids have loved for a long time. Ahhhh"! -J.I. "My child got red ink all over his velvet chair, but it ALL came out in one wash!" -D.L. Here are a few sample styles for girls and boys, click for more!